With semimodular design for quick trim changes and the same state of the art materials as BST's B1 series, the B1.5 offers a larger flow area (Ø1½" = 1.77 in2) than any other choke in its class. Double, self-energized PTFE seals create a bubble tight seal at the stem, ensuring long life and smooth hand operation, even after years of rugged use. You can't buy a better choke, because BST makes it rugged - but simple - for your safety and ease of operation. • EZ-VU handle allows 64th indications to be viewed from any angle aaround the choke. Handy T-Bar handle is optional. • Easily tuned for precise adjustment and control. • Can be locked in the adjusted position. • Double, self-energized PTFE stem seals and Viton O-rings standard (Aflas O-rings optional). • All internal control surfaces constructed of 17-4 PH stainless steel. • Easy, safe access to internal parts without removing the body from the line. • Available in a wide variety of end connections (buttweld, socketweld, threaded NPT/LP, API 6B or ANSI B16.5 flanges) and sizes (2" and 3"). • Standard trim size is 1½" (1" and 1¼" also available); standard material is 17-4 PH stainless steel (tungsten carbide available). • Standard 4130 alloy steel body and bonnet rated to 5,000 psi working pressure. • Angle body (shown above) is standard. Through style body is optional. • Corrosion resistant alloys optional. • Standard temperature range: -20°F to +400°F. • Special high temperature versions optional: B1.5HT (-20°F to +500°F) and B1.5HTG (-150°F to +800°F). • Contact BST Engineering for standard centerline to flange face dimensions. • Designed and manufactured in compliance with API Spec 6A. 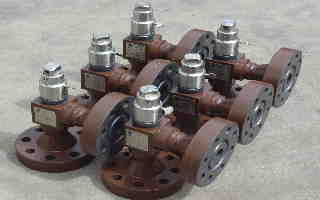 • Suitable for NACE MR-01-75 applications. To calculate liquid flow through a B1.5 choke, click here. To calculate gas flow through a B1.5 choke, click here.